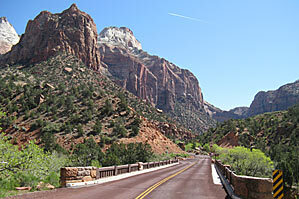 Zion National Park is one of the most popular attractions in the southwestern United States. It includes almost 150,000 acres of ruggedly beautiful cliffs and canyons. About 90% of the park is managed as pristine wilderness. 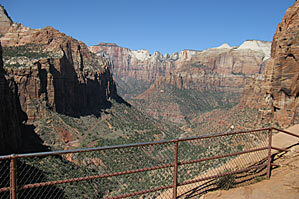 First established in 1909, Zion is Utah’s oldest and most popular national park. People are drawn to the park because of its unique natural beauty and because it offers a multitude of recreational opportunities – from auto touring to hiking to horseback riding. Some of the most beautiful areas in the park can be seen from the comfort of an automobile as you drive scenic Hwy 9, or ride the shuttle into Zion Canyon. 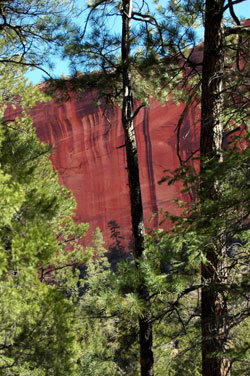 Other popular auto touring routes include the Kolob Reservoir Road and the Kolb Terrace Road. 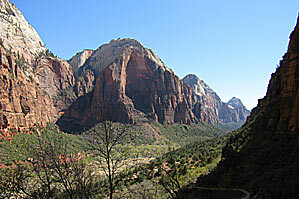 Many of the park’s most famous attractions and hiking trails are located in Zion Canyon and are accessible via the shuttle, which makes a convenient stop in the town of Springdale right by Majestic View Lodge. 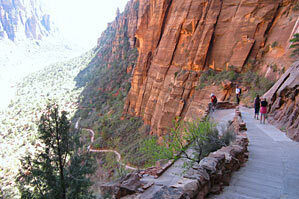 Popular attractions include the Emerald Pools, Great White Throne, Weeping Rock, Angels Landing and The Narrows. Zion is a world-famous destination for rock climbing (it offers some of the most challenging big wall climbs) and canyon hiking. 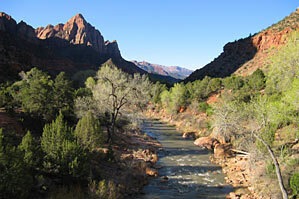 The Virgin River Narrows is perhaps the most popular canyon hike in the world. 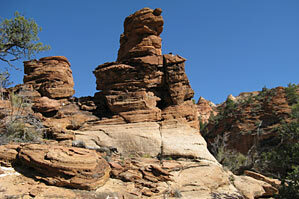 Other canyon hikes are more challenging and have given rise to a sport called canyoneering. Canyoneering is an adventure sport where hikers make their way down narrow canyons, climbing over obstacles, sometimes rappelling, sometimes wading/swimming through potholes filled with water. Such adventures can range from mild to incredibly challenging. Whatever the difficulty, they are always fun. Whether you come here to relax and soak in the scenery, view wildlife, enjoy mild activities with family or friends, or participate in intense, adrenalin-packed adventure, you’ll never find a better place.